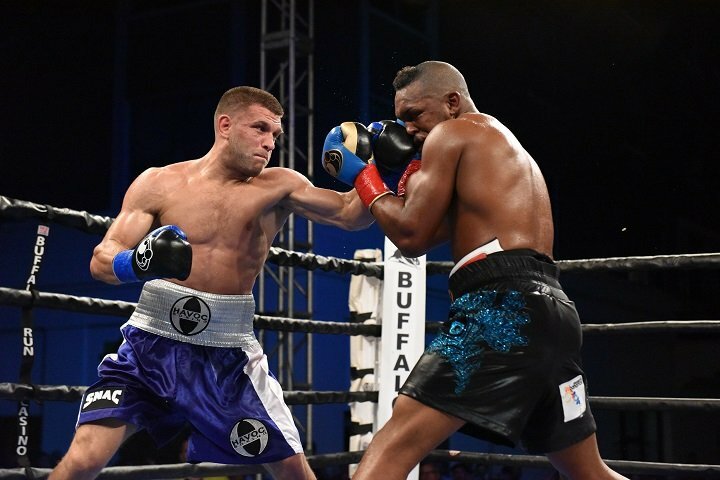 By Mike Smith: Sergiy Derevyanchenko (12-1, 10 KOs) will be facing Jack Culcay (25-3, 13 KOs) in an IBF middleweight title eliminator on April 13 on Premier Boxing Champions on FS1 at the Armory in Minneapolis, Minnesota. The Derevyanchenko-Culcay fight will be the co-feature bout on the Peter Quillin vs. Caleb Truax card. The winner of the Derevyanchenko vs. Culcay fight will be the IBF mandatory challenger for the winner of the May 4 fight between IBF 160 lb champion Daniel Jacobs and WBA/WBC champion Saul Canelo Alvarez. Derevyanchenko, 32, is being given another shot at the IBF title after losing his last fight to Danny Jacobs by 12 round split decision in a match for the vacant International boxing Federation 160 lb title three months ago on October 27. Rather than having to get back in line to crawl his way to a title shot, Derevyanchenko is immediately being put back in position to fight for another title. It’s understandable from the IBF’s perspective. The 5’9″ Derevyanchenko was competitive with the more experienced and bigger 5’11 1/2″ Jacobs. If Derevyanchenko had been just a little bit more aggressive in forcing the fight on Jacobs, he might have beaten him just like Gennady Golovkin and Dmitry Pirog had done in the past. Jacobs under pressure. Derevyanchenko spent too much time boxing Jacobs in the early going, and that caused him lose crucial rounds in the fight that he was forced to make up later. Derevyanchenko ended up losing the fight to Jacobs by the scores 115-112, 115-112 for Jacobs, and 114-113 for Derevyanchenko. It was very close. If Derevyanchenko makes a few small changes in his game, he’ll make it tough on the winner of the Canelo vs. Jacobs fight. If Canelo beats Jacobs, he might not hold onto all the titles long enough for him to defend it against the Derevyanchenko vs. Culcay winner. It’s believed that Canelo will face Golovkin later this year in September, and if he wins that fight, he’ll fight the WBO middleweight champion in May 2020. The WBO belt will be either Demetrius Andrade or Billy Joe Saunders, as those two are expected to face each other next in 2019. Canelo’s promoters at Golden Boy are going to want to put him in against the guys that will bring him the most attention, and it’s unclear whether they’ll be excited at having him use up one of his valuable fights facing the winner of the Derevyanchenko-Culcay fight. Culcay, 33, comes into the fight with Derevyanchenko having won his last three fights since losing consecutive matches to Demetrius Andrade and Maciej Sulecki at 154. Culcay moved up to 160 after his loss to Sulecki in October 2017, and he’s reeled off victories over Craig Cunningham, Adasat Rodriguez and Rafael Bejaran at middleweight. Like Derevyanchenko, Culcay was an excellent amateur, competing in the 2008 Olympics. Culcay finished his amateur career with a 95-28-3 record. Obviously that’s not the same kind of amateur record that outstanding fighters like Vasyl Lomachenko, Gennady Golovkin and Guillermo Rigondeaux had, but Culcay was still a very good amateur. At 5’7 1/2″, Culcay is a little undersized to be fighting at middleweight. Most of the guys at 160 are 5’9″ at the very least. Saul Canelo Alvarez, 5’8″, is one of the rare exceptions of a short fighter doing well at 160. Of course, he has several controversial wins and a draw on his record that he might have been losses if he wasn’t such a popular fighter. Culcay will need to be able to overcome the reach advantage of Derevyanchenko and the other middleweights in the division for him to do well in this weight class. The 2008 Olympian Derevyanchenko is going to need to be able to increase the pace of his fighting style for him to beat a smart fighter like Culcay. The German fighter knows how to push a fast pace in a fight to wear down guys that throw few punches like Derevyanchenko. In an example of that, Culcay took the fight to Demetrius Andrade and just barely lost a 12 round split decision in March 2011. Culcay gave Andrade all he could handle simply by staying on top of him and pressuring him the entire fight. The fast pace that Culcay forced Andrade to fight at wore him down, causing him to lose a lot of rounds that he would have won in the second of the fight if the fight had been fought at a slower pace. The one thing that Derevyanchenko has a problem with is the pace of his fights. His stamina isn’t that good, and he doesn’t like to fight at full bore. Tureano Johnson gave Derevyanchenko a lot of problems with his high pressure style of fighting in August 2017. Although Derevyanchenko won the fight by a 12th round knockout, he took a lot of big shots from Johnson in that fight. Derevyanchenko was able to slow the pace of the fight by using move, jabs and not letting Johnson crowd him the way he wanted to.